The principal online portal used by naturalists in Belgium is the multilingual www.waarnemingen.be/observation.be (of the global www.observation.org family). Since its launch in 2008, it generated 29 million records of over 20,000 species (the portal accommodates all taxa). Most records have traditionally been casual observations, resulting in presence-only type data. Making complete lists was possible online since 2012, but never became popular. Since 2016, more than 50% of observations are registered using mobile phones (80% Android). Hence, a smart and easy check-listing system was developed linked to track recording in the app ObsMapp (for Android). With the support of the Life project EuroBirdPortal, listing of at least all species (but whenever possible also all individuals) was promoted from spring 2017 in various ways, but principally by repeatedly raising awareness amongst observers of the value of check-list data and of the ease to produce them in ObsMapp. There were some 20 announcements, e.g. as news items on the website, in electronic newsletters, on social media and publications in bird journals. The number of lists collected is now also shown as part of the daily statistics on the home page. The promotion of complete lists became a standard item in courses, talks at symposia and webinars. The top100 ranking observers (responsible for 42% of all bird data) were contacted individually with tailor made advise on how to improve their data by listing and track recording. 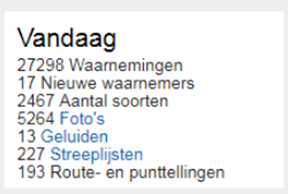 Making lists is also one of the criteria in the 10-year waarnemingen.be anniversary competition (with daily personal stats shown on the website). This promotion campaign doubled the flow of lists in a few weeks. The number of records attached to lists increased from 3,2% in 2016 to 10.6% of all records in 2017. 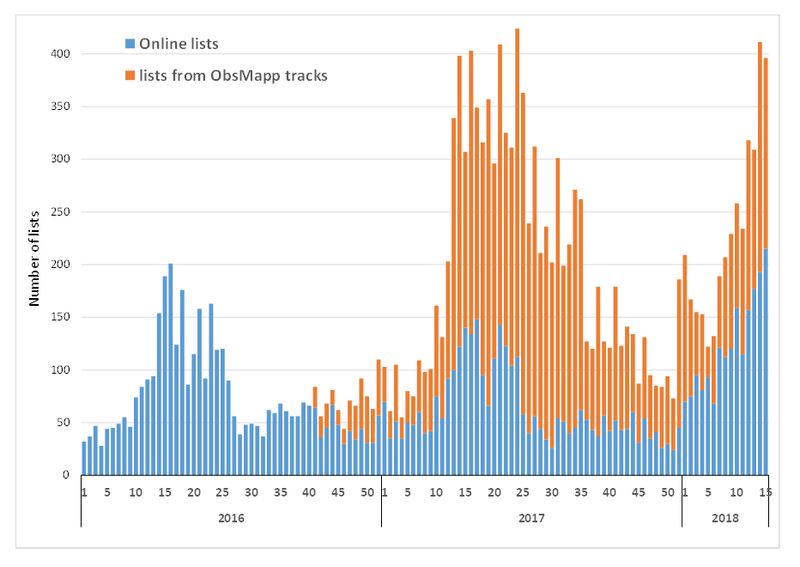 Listing linked to track recording in ObsMapp quickly became the principle way of producing lists (It is now also being built in iObs for iphone). The number of lists shows a strong annual cycle, with almost 10 times more lists in spring and early summer. That is mostly because this is a multithematic portal and listing of e.g. butterflies, dragonflies or bees ceases in winter. Preliminary analyses of bird lists demonstrate their usefulness. For example, outbreaks of Usutu virus affected birds in parts of Belgium in summer 2016 and 2017 for the first time. Blackbirds were particularly badly hit. Because there is no close link in such abundant species between the number of observations and the number of incidental records being reported to the portal, incidental observations cannot be used directly to investigate the impact of Usutu, other than as an indication from the higher number of dead or ill birds reported that there was a problem and when it occurred (dotted lines in the figure). There were more dead or ill birds reported in 2017 and they occurred a month earlier than in 2016. Even though the number of lists is not all that large yet (and therefore graphs are not very stable), it already gives a much better indication of the impact of Usutu: during the first limited outbreak in only a small part of the country in 2016, the reporting rate of Blackbirds dropped by some 15% in August-September 2016. Reporting rates remained 10% lower throughout spring 2017, but crashed by more than half during a more severe and more widespread outbreak in July-August 2017. Reporting rates recover in autumn with the arrival of Scandinavian migrants, but in spring 2018 reporting rates drop again some 10% lower than in 2017. 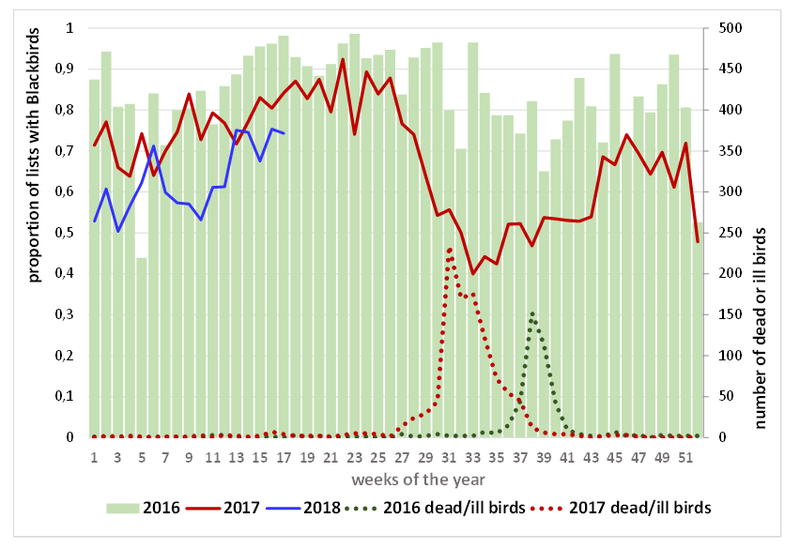 Reporting rates of Blackbirds in complete lists in Belgium by week and the number of birds reported dead or ill in 2016-2018 after outbreaks of Usutu virus. A contribution by: Marc Herremans, Kristijn Swinnen, Elke Leys and the observation.org programming team.